Here is a glimpse into new profits financed by the old man… at least old in this new era. In case you do not know who this old man is, it’s a Case… as you are about to see. This is the era of the internet, wi fi, smart phones, tablets and apps. The filed is dominated by Apple, Google and Amazon.com. But, this is a disruptive era. Amazon for example has turned huge industries upside down… and knocked booksellers, publishers and many retail businesses to their knees. Is Amazon next? I love Amazon personally… love my Kindle and love online shopping. There is no surprise that subscribers have profited from our Self Publishing course that shows how to self publish at Amazon.com. Nor is it a wonder that I have been asking… “what’s next”? What comes after Amazon.com? Self publishing at Amazon.com is evolving. The idea of simply publishing and just waiting for royalties to roll in, is well along the bell shaped curve. Amazon will be with us for some time I think.. but the new technologies are already on their way. Changes are taking place in the internet world. They will not shift overnight. No one is totally sure of the end product… but there is a battle between giants right now. While they are fighting the newcomers are on their way. Amazon.com will change. The firm has incredible income but small profit. Amazon is the smallest of the three giants, Apple, Google and Amazon.com. This graph comes from an Economist article (Battle of the Thrones – linked below) and shows the sales and profit of four internet era firms. This is revealing and tells an important tale. Many self publishers are learning how to sell their books via Amazon.com. Amazon is the 1,000 pound gorilla on the block when it comes to selling books… but for how long? Just when everyone thinks they have the system figured out… a new disruption comes along. Ask the guys about at Borders or Barnes & Noble! Wait… that’s right. Borders is gone. Graph from Economist article “Battle of Thrones”. Click on chart to enlarge. Will Amazon follow in the foot prints of Borders? Not for awhile. Amazon has the least cash and lowest profit but that’s because it is plowing money back into its evolution. Will it remain in the running or will micro businesses, writers and publishers who now rely on Amazon.com have to learn a new app? An article at MIT Technology Review titled “Why the Father of the Consumer Internet Invests in E-Commerce” shows how internet publishing and e-commerce are evolving. The article says: Steve Case brought the Internet to Main Street. Now he wants everyone to open an online store. Now Case, 55, has come out of semiretirement to create Revolution, a Washington, D.C., venture capital fund that he says will become the largest startup investor east of the Mississippi River. Case is no buzzword-dropping futurist. He’s practical, with a sharp eye for Main Street’s needs and, he says, “big ideas that are still small companies.” So it’s significant that his fund has bet most heavily so far on e-commerce startups. Its largest investment, $40 million, went to BigCommerce, a company that brings “Amazon-like capabilities” to any merchant. The pool of potential customers is huge: 95 percent of retail establishments in the U.S. consist of a single store. Here is a chance to get into the very beginning of a new trend where there is the greatest potential. The internet has created the broad band era where smaller is bigger. Steve Case is financing the refinement of this technology so many Davids can compete with the few Goliaths. The “For Certain” principles in this uncertain world are – Reach, Engage, Focus, Monetization. Whatever the results of this battle, the 7Ps create opportunity for micro businesses. The 7Ps identify, reach, engage, focus and solidify customers at a profit. The 7Ps reflect an immutable logic that worked in paper direct mail before computers. They worked with computerized Cheshire labels. The 7Ps worked jet printing on envelopes and personalized emails. They work for web sites and blogs. Our writer’s camp and online Self Fulfilled delegates and Event Full subscribers are using the 7Ps successfully right now at Amazon.com and in numerous micro businesses. The 7Ps will work even better in this next communications revolution. Plus ce change plus ce la mem chose. The more things, change the more they remain the same! This applies to the 7Ps. There are few people more capable of answering this question than… Merri and me because we have been using the 7Ps for over 45 years. Since May 1968 we have been paid to travel and live exactly where we have wanted to be… because we have known how to write to sell and monetize the publishing success with events, seminars, courses and tours. The combination of self publishing working hand in hand with an events business has allowed us to visit and to live anywhere in the world we have desired. Sometimes we have really romantic adventures. 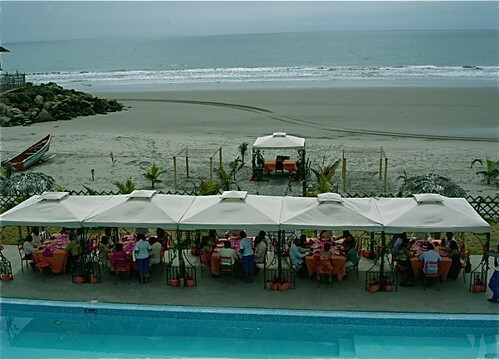 Here is Merri and me with delegates dining on an Ecuadorian beach. However we also conduct self publishing and events businesses from home. One does not have to travel to self publish or have an events business. Self publishing and events can be incredibly simple businesses operated from a dining room table or in my case beside the pool . Here I am early morning… at home… cup of coffee in hand, reaching readers all over the world. You can have your choice… travel… business from your home… or both! This readers is using an events based business to generate income that pays for Ecuador travel. “Event – Full Business” shows how to start small and gradually build a larger events business (if that is your desire) as we have done. We have conducted events as small as two delegates and some with over 400 so we know the events business inside and out… large and small. The pay has certainly not been bad either. One event earned $142,260 in three days. In another instance we earned over $135,000 in two days. Once our earnings exceeded $200,000 in just three days. More often we bring in $10,000 for a weekends work. Fair enough? These facts have dramatically enriched our lives. Our online course combined with our online self publishing course teaches you how to gain a special income generating synergy. This is why we have created special program so readers can enjoy both our guaranteed online courses “Self Fulfilled – How to be a Self Publisher” and “Event Full Business – How to Have a Seminar and Tour Business” and save $149. “Self Fulfilled – How to be a Self Publisher” is regularly available for $299. 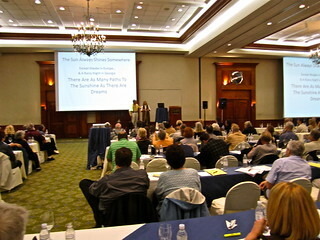 “Event Full Business – How to Have a Seminar and Tour Business” is $349. We share what we know about events in our emailed correspondence course: “Event – Full Business” which contains 17 lessons. Obviously, something we did for this client 25 years ago brought him back to us. When it comes to conducting seminars, courses and tours, there are few people with more experience than Merri and me. Over 45 years we have organized, marketed and conducted thousands of tours for tens of thousands of people in dozens and dozens of countries (even behind the Iron Curtain). Event – Full Business – How to have a seminar and tour business sells for $349, but in this special offer you receive both fully guaranteed online courses “Event – Full Business” and “Self Fulfilled” for $499 and save $149. Self Fulfilled-How to be A Self Publisher. There are growing numbers of great stories about beginning writers using Kindle to sell their publications. One great story is about Hugh Howey, a writer that every self publisher should meet and hear. Read Hugh’s story here. Hugh Howey is a self-described “bum,” who bounced from computer repair, to yacht captain, to bookstore clerk. In his spare time he wrote science fiction, and in 2011 self published his post-apocalyptic novel Wool. Soon he was earning him over $100,000 a month on Amazon, had secured him a six-figure book deal from a major publisher and his book had been optioned for film by Ridley Scott, director of Blade Runner and Alien. Hugh is an inspiration and you can see numerous interview’s with Hugh at our website. Part of Hugh’s formula was to lower his sales price as low as $.99. This compares to the typically $9.99 to $12.99 for other books on Kindle. The low prices started enough people reading his book Wool. Suddenly sales of Wool took off through word of mouth. After the book became a best seller at Amazon.com the foreign rights, six figure print deal and film rights flowed naturally. Most writers will not do this well. Most of us don’t need to. This is a new exciting era for writers. This is exciting news for those of us living in small towns. There are three keys to success in this type of writing and publishing. We have repeatedly stressed them at our websites and in our business courses. Use the 7Ps. These websites create a community of like minded souls around this niche. The 7Ps help us find and monetize this niche. Our self publishing course includes how to use the 7Ps to self publish for profit plus includes “Self Publishing 202… How to Publish on Kindle”. Learn how to develop your publishing skills to turn your passion into profit! If you can’t write… publish the writing of others instead! Whatever your passion, you can immerse yourself in it for extra income and the kind of fulfillment you’ve always wanted in life. Whether you want to travel the world or live as a recluse, work 12 hours a day or not work at all, learn more about golf or feeding the hungry… it can be yours if you’re willing to learn. In 1974, I had what I thought was a good business, but to be honest, I could never get ahead. I was almost penniless, in debt and living from hand to mouth. Then I discovered the secrets to avoiding the pitfalls. Since then, our publishing business has brought in millions. Now, Merri and I have packed over 45 years of global publishing and business experience into our course on how to have Self Publishing business. Before I tell you how this program can help you create your ideal lifestyle, I want to make an important point. I’m not promising that this program will make you rich overnight or that you’ll wake up tomorrow with a more satisfying life. If you’re looking for a way to get rich while you sleep, without discipline and dedication, you should stop reading right now. But if you’re willing to invest a reasonable amount of time and effort into learning and applying this simple system, it will put you squarely on the road to becoming a wealthy and fulfilled as a publishing entrepreneur. In Self Fulfilled – How to be a Self Publisher Merri and I give away every publishing secret we know and expect those who use this powerful program will improve their lives. This course is updated regularly, it is based on the trial and error experiences Merri and I have had for the past 45 years… the very experiences that have made us self-fulfilled multimillionaires. * The $299 online course “The Tangled Webs We Weave – How to Have an Internet Business”. * Our Super Thinking Workshop in an MP3 file so you can listen on your computer, burn a disk or listen on you Ipod or in your car. 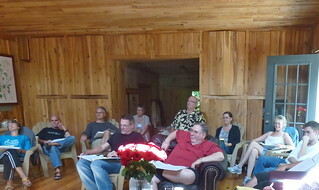 This workshop was conducted and recorded last February 2011 and is a $199 value. * A special report only available to those who enroll in “Self Fulfilled” entitled “Three Secrets for Creating Publishing Ideas”. Self Fulfilled is normally $299. Event Full Business is normally $349. This special offer gives you both for $499. Save $149 when you order both “Self Fulfilled – How to be a Self Publisher” and “Event – Full Business”. If you’re not completely convinced that this information is helpful to you—all you have to do is let us know and you’ll receive a complete refund of every penny of your subscription. We welcome you to “Event – Full Business” and Self Fulfilled. We’ll be doing all we can to help you create a rich and fulfilled lifestyle that stretches well beyond your dreams with a self publishing business that supports events.